The medieval physician Paracelsus described oppodeltoch, a word he seems to have conjured up from heaven knows where. One suggestion is that he derived it from bits of three other words: opopanax, bdellium, and aristolochia. All three names come from Greek. The first is a foetid gum-resin from the root of a plant resembling the parsnip whose name is from opos, juice, plus panax, all-healing; the second is a fragrant resin related to myrrh; the third means “well-born” and refers to a shrub that in Britain has sometimes been given the name common birthwort because it helped childbirth. Paracelsus applied the word to a type of medicinal plaster and it appears in English with that sense until the seventeenth century. After that, it shifted dramatically, under the revised spelling of opodeldoc, to refer to various sorts of liniment based on soap dissolved in alcohol, with herbs and aromatic oils added. 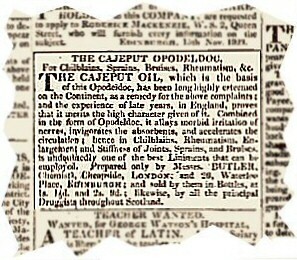 This advertisement for the Cajeput Opodeldoc appeared in the Edinburgh Advertiser in February 1823. It goes on to remark that “It is the best embrocation for Horses that are wrung in the Withers.” Truly an all-purpose palliative. Last modified: 27 May 2006.